Ka Firetask is an easy to use task automation program for Windows using which you can run applications, copy files and folders, display message dialogs. The task that are created using Ka Firetask can be triggered by hotkey or scheduled to be triggered at particular time. This utility offers far more features than the Windows task scheduler hence is very useful tool if you want to automate lot of things in your computer. This program uses a procedural scripting language called DNM script using which you can create advanced and complex tasks. Ability to create and run tasks on a specific day of a week and time. Tasks can be repeated at a specific interval. 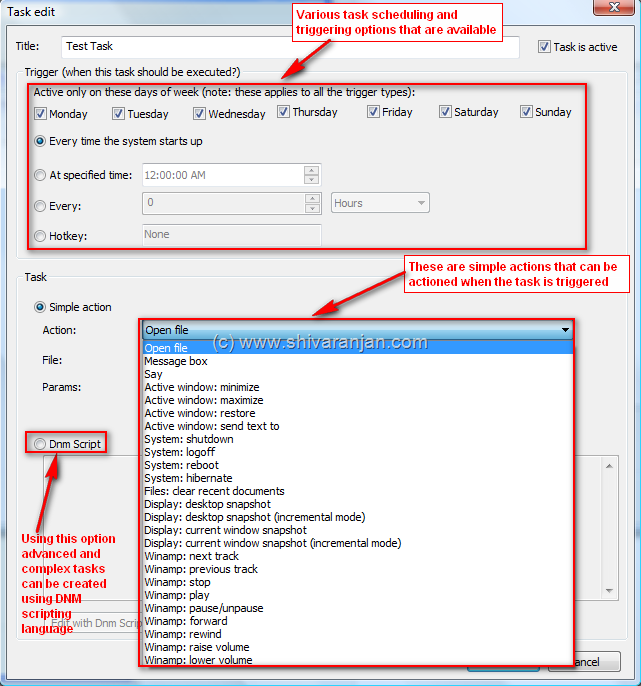 Trigger the tasks using a hotkey. The task can trigger simple action like opening a file, message box, Active window can be minimized / maximized / restored, system can be shutdown / log off / reboot/ hibernate and can take incremental snapshot of desktop or current window. Advanced and complex tasks can be created using DNM scripting language. There are some standard tasks that you can directly download from their website and start using those tasks. 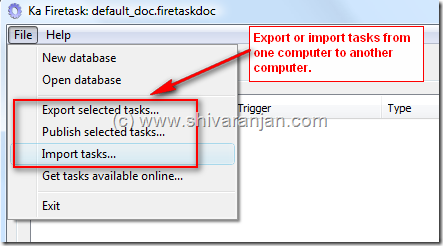 Firetask provides to export and import tasks which is a very useful feature using which you can easily use a set of tasks across multiple computers.